The SenzeBand and Memorie is a unique invention with an absolute purpose of creating self-awareness towards mental health and cognitive development. How do we do this? By bringing neuroscience out of the research labs, and putting them into the homes of communities. For the first time, you’ll get an accurate first look inside of your brain and understand every minute reaction that your mind makes to your surroundings. Compatible with the following devices: Android devices – Samsung Galaxy Tab4, Note 10.1 and higher/Android devices running Android OS Lollipop 5.0 and above, and Apple devices – iPad Gen 3, iPad Mini, iPad Air and higher. iPhones with iOS 8.0 or later. The SenzeBand accurately detects brain signals when worn, and translates them into feedback and data shown in a mobile app called Memorie. Know how your brain reacts to mental challenges, and sharpen your mind by taking on mental tasks within the Memorie app. 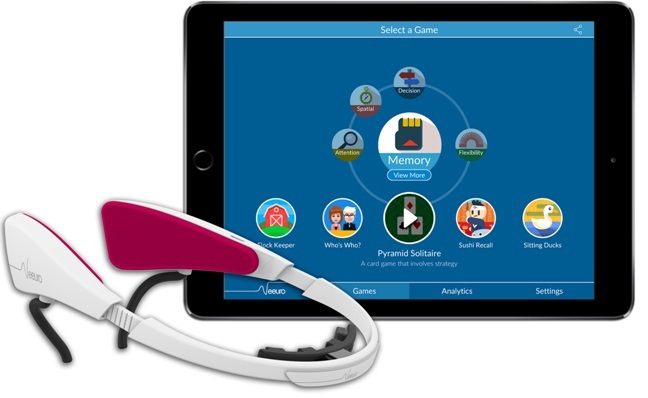 Memorie comes with over 15 cognitive games designed to help you keep mentally active. These games were designed based on neuroscience to stimulate your focus, memory, decision-making, spatial awareness and cognitive flexibility for an all-round brain boost. We show you your levels of relaxation, attention and mental workload, based on the brain signals that we read. With the SenzeBand and Memorie, you’ll finally be able to understand and take control of the most complex organ in your body. While you challenge yourself with the tasks within Memorie, we don’t just give you your usual game scores. We tell you if your mental workout is at its most optimal by giving you added measurements. Our Behavior Score shows how well you use the relevant skills needed in each game, eg. memory or speed in decision-making. Our Brain Score gives you a formula showing how much focus and mental effort was detected from your brain. The Memorie app comes with loads of other useful features. With detailed progress reports, training assessments, and measurements of your overall performance, we make sure that you get the most out of your mental workout.